This is the last of my five blog series on the best places to visit within driving distance of Manila in 2019. In this blog, we will take a look at Quezon province. However, I need to clarify this a little bit in that a couple of these places do involve a short flight or boat ride. However, being in the Calabarzon region, they are still in pretty close proximity to Manila. Some of these places are absolute gems and are among some of the best places in the Philippines. Although not quite as famous for scuba diving as Batangas, there are still some beautiful beaches and other fascinating places to visit in Quezon province. So for this article, we are going to look at the top 10 places to visit in Quezon province in 2019. I remember stumbling across pictures of Borawan Island on the internet. My first reaction was that I could not believe this place was within driving distance from Manila. From the photos, I could see large limestone cliffs that looked like it was in Palawan. 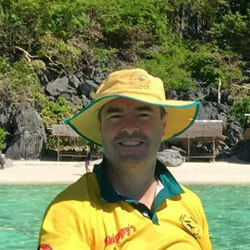 Then there was beautiful white sand that easily could have rivalled Boracay. 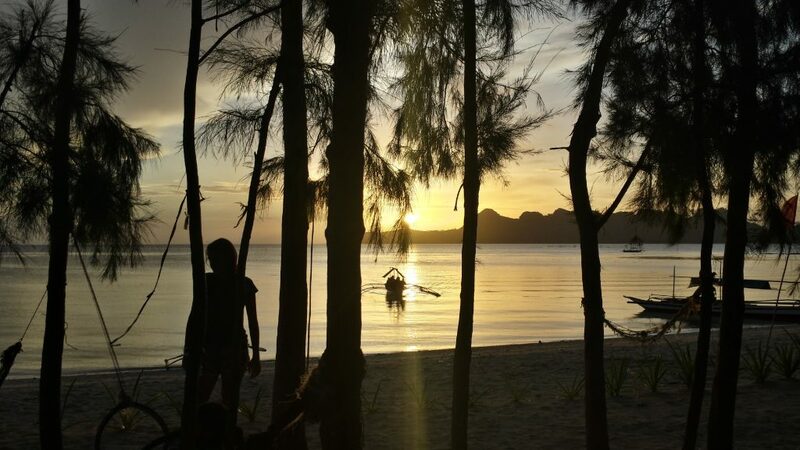 This is why this place is called Borawan because it really is a perfect mixture between Boracay and Palawan. Borawan is actually a beach, not an island and is located on Paglibao Island in Padre Burgos. Amazingly, it is less than a 200-kilometre drive and a short boat ride from Manila. This really is one of the best Philippines destinations. There are a number of small cottages available in which you can hire for the day (or half day). There are also a couple of small stores selling snacks and drinks but it is advisable to bring your own. If you left very early in the morning you could do this is as a day trip, that’s how close it is. However, it probably would be best to stay overnight and enjoy this place and some nearby beaches. There is a resort nearby called Tamarind Tree Resort, or you can do as I did and stay somewhere in nearby Lucena City. Puting Buhangin literally means white sand. This is located on Paglibao Grande Island and is about a 30-40 minute boat ride away from Borawan beach. 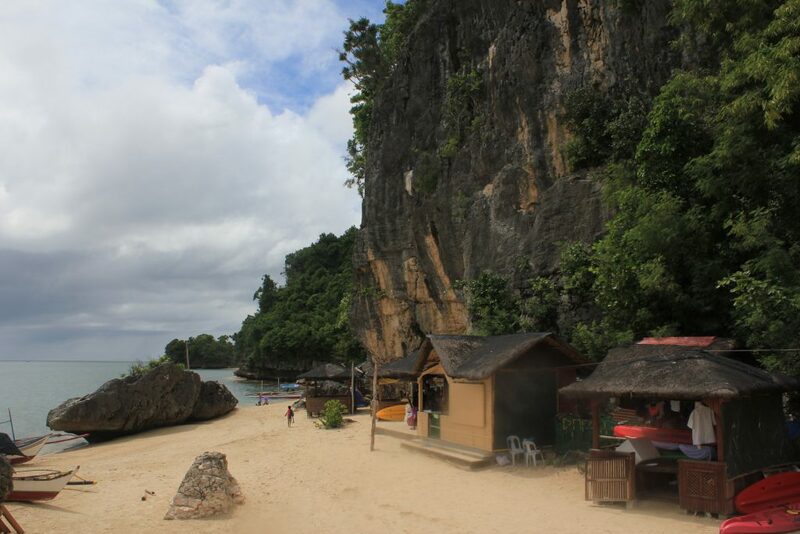 This area is also known as Kwebang Lampas which is also the name of the cave at the end of the beach. This is actually a private beach but is open to the public. The sand here is a lot cleaner and whiter than Borawan, and the water is absolutely sensational. There are a number of nipa huts available so that you can sit down and enjoy a picnic for lunch. There isn’t much in the way of food and drinks there, so it is advisable to bring your own. Just like Borawan, Dampalitan is called an island which is not. It is actually a small peninsula that juts out from the mainland of Quezon province. When we visited this place there was hardly any people here at all and we had a complete run of the beach. We visited Dampalitan beach during the same trip in which we visited Borawan and Puting Buhangin. This is the best way to take in this section in Paglibao. We hired a boat from one of the local fishermen and he took us to Borawan, Puting Buhangin and Dampalitan, which is a whole day trip. Dampalitan is quite unique in that there are a number of pine trees along the shoreline mixed in with the palm trees. The sand is just as good if not better then Puting Buhangin. When we arrived it was already quite late in the afternoon so we decided to stay and watch the sunset. To this day it is still probably one of the best sunsets I have ever seen. Truly remarkable. This is easily one of the most unique places in the Philippines. Regular readers of my blog will know that I covered a number of different waterfalls in this country. Every one of these waterfalls is different from each other, however, be prepared for something totally different at Villa Escudero. 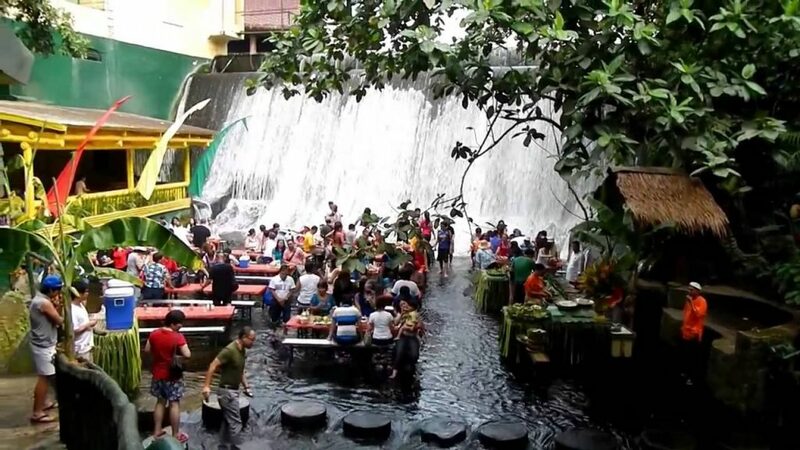 Not only is there a sensational waterfall, albeit man-made, but there is also actually a restaurant built at the bottom of the waterfall. This means that you can actually sit down and eat while ankle deep water. Villa Escudero itself is actually a coconut plantation that has actually been developed into a resort. There is accommodation available as well as a village tour and a museum tour. This is a place that you can easily do as a day trip however, if you are looking to get away from it all for a night then this is a great alternative. It is a great place for families. I have written about Mt Banahaw in my article that covered the top 8 volcanoes in the Philippines. Mt Banahaw is actually classified as an active volcano with its last recorded eruption occurring in 1909. At a whopping 2,170 MASL, this beast is clearly visible as you head to the southern part of Quezon province. It is, in fact, the tallest mountain in the Calabarzon region. 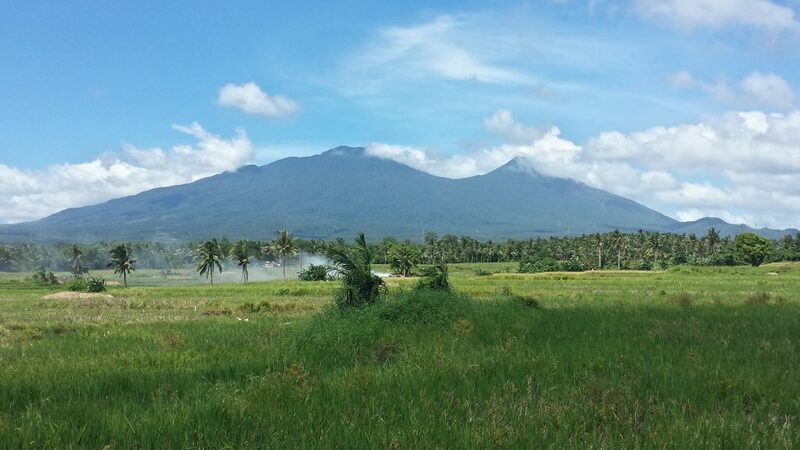 The locals refer to Mt Banahaw as “Holy Mountain” and it is considered a very sacred site. This is a popular destination for hiking enthusiasts. If you are into a bit adventure and hiking then this is a great place to visit. This amazing place is located less than 100 km away from Manila, and just one-hour boat ride from the town of Mauban. Cagbalete Island is famous for “hibas”, which is the local term for low tide. During this time, the ocean rolls right out and exposes even more of the beautiful white sand beach that is the main attraction of this place. This is a privately owned island and has a very diverse ecosystem. As a result, there are a number of activities that you can indulge in including island hopping, bird watching, horseback riding, swimming and snorkelling. There are a few accommodation options available on the southeastern part of the island if you wish to turn this into an overnight or weekend visit. 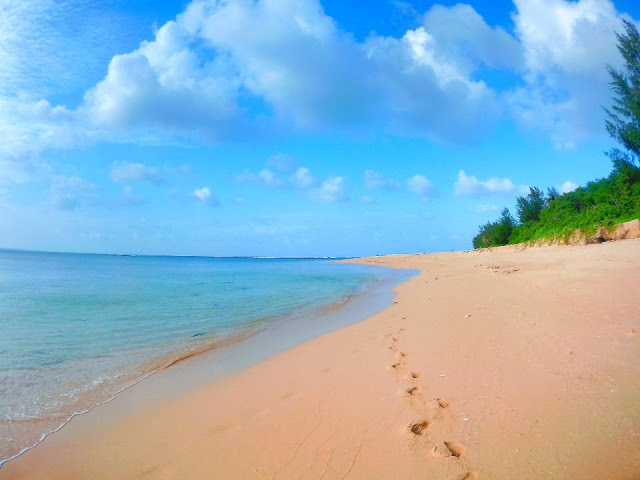 Located on Jomalig Island, Salibungot Beach is a golden sand beach situated on the western side of the island. Although Jomalig Island isn’t far from the coast of the mainland, it can still take quite some time to get there by boat from Real. The boat ride takes at least four hours. There are a number of accommodation options available on Jomalig Island and it is highly recommended to take a bike tour around the island. 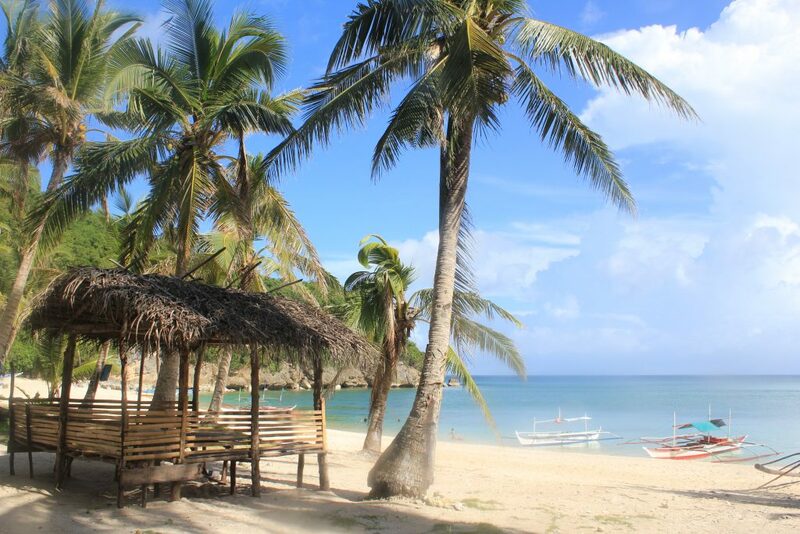 However, if you just wish to chill out and do nothing, then Salibungot Beach is the place to be. As this beach faces west you can also catch the sunset. Also located on Jomalig Island, Kanaway Beach is situated on the opposite of the island and is about 45-minute motorbike ride away. Being on the east coast of the island, this beach faces out toward the Pacific Ocean. 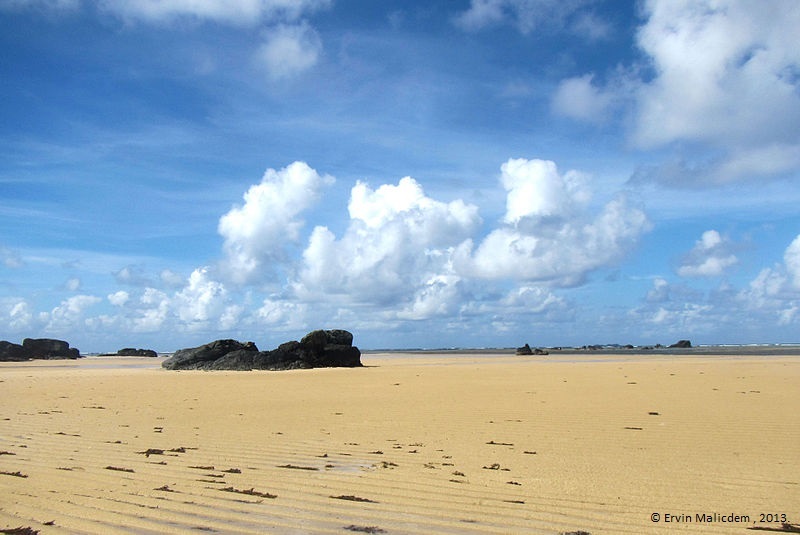 This beach also has golden sands with the beach itself stretching out from the shore as much as 400 metres! There isn’t much in terms of accommodation on this side of the island so it would just be a place to visit for a couple of hours while taking in the rest of Jomalig Island. 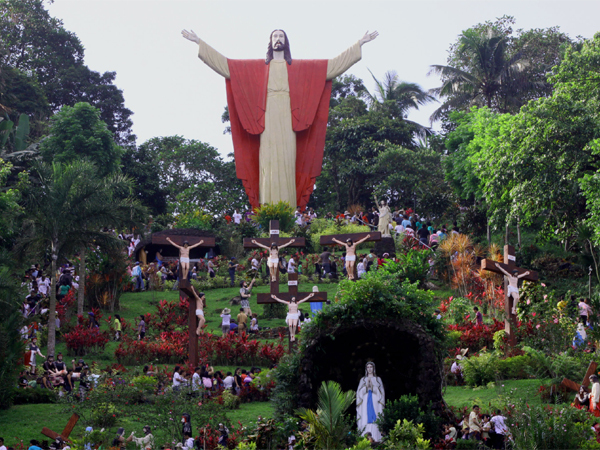 Located in the municipality of Lucban, this is one of the most popular tourist attractions in the area. In fact, there are close to 4 million visitors to this place annually. If you want to get a little more immersed in the local culture and understand a little bit more about the Filipinos, then visiting places like this helps to give you a good understanding. From the top of the hill, the views looking out toward Mt. Banahaw are spectacular. If you are looking for something a bit different to do, then this place might fit the bill. You could tie this in with a visit to Borawan by taking the back way to Manila. Although Balesin Island is an exclusive private resort, this is a place I just have to include in my top 10. It is a members-only resort and is not available for just anybody to go to. However, if you happen to know a member then you simply must speak to them about having a visit. This is one of the most unique places I’ve seen in the Philippines. It contains luxurious villas whose themes are inspired by several different countries including Bali, Italy, Greece and Thailand. 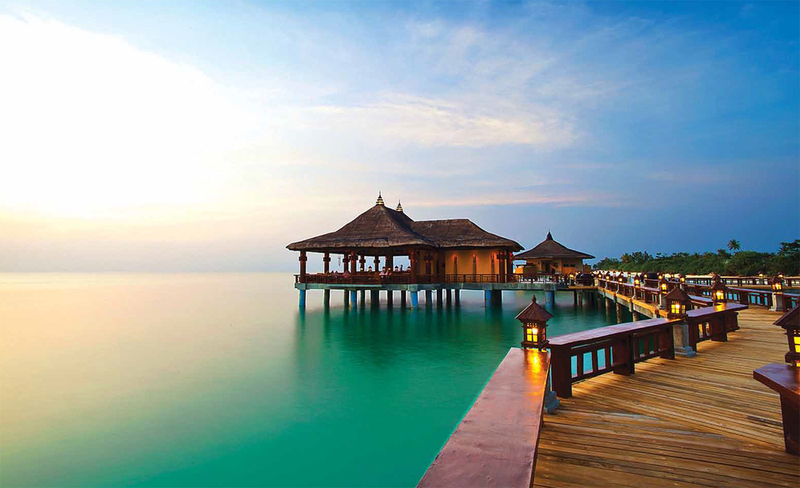 This is complemented with pristine white sand beaches, clear blue waters and luscious landscape. Unfortunately, I haven’t had the opportunity to go there yet, but I do know a member so it is definitely on my radar. Please check out my related links below and feel free to share this article with family and friends and also join the conversation below!